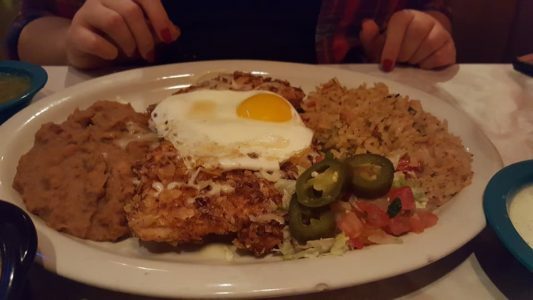 While we had driven by the Chuy’s in Columbus, Ohio a number of times over the last few years, it was not until we moved to Arkansas to have a chance to stop in and see what the restaurant had to offer. We were immediately seated and given a run through about the menus. Our basket of tortilla chips was refreshed with fresh fare a few times through the meal. We believe that Chuy’s succeeds because it has such a wide array of sauces. 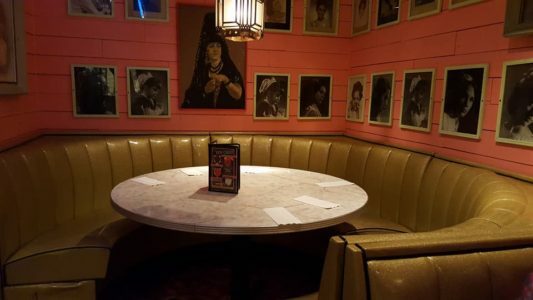 We tasted each of the chain’s sauces on a “rainbow plate” and were particularly impressed with their Ranchero, which added considerably depth to anything we dipped into it. The Tomatillo sauce was well spiced and spicy, linking together a bit of heat with garlic and onions. Of course, Chuy’s is known for their Boom-Boom sauce, a cheesy sauce that includes green chilis from New Mexico, tomatillos, green onions and cilantro with a hint of lime sauce. The Hatch Green Chile sauce was bar-none our favorite, with a good amount of heat matched with onions. The dough balls that the waitress gave to our daughter ensured silence, while the spectacle of seeing workers make the tortillas in-house was another fun distraction. Finally, there was a unique, funky, and individualistic flair weaved throughout the restaurant’s decor. Whether one is seated in the hubcap room, notices any odd tile or fitting, or looks at the hand-carved birds or one-of-a-kind paintings, one will always be engaged. Chuy’s offers a wide variety of draft and canned offerings. 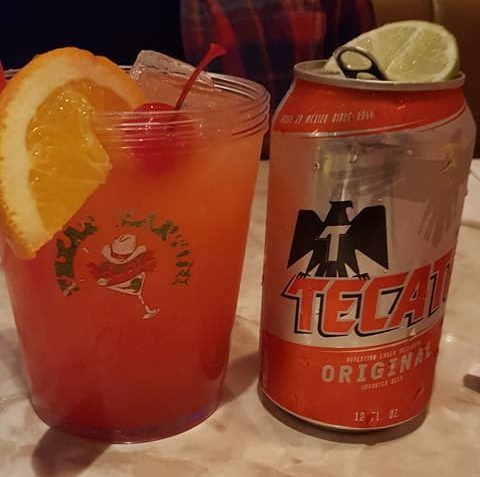 I chose to match my food with a Tecate, while the wife had a pair of their special drinks – The King’s Punch ($9.79) and La Pina Colada ($8.99). The King’s Punch was a great way to get our meal started, a drink that had equal portions sweet and tart, put forth to the next level with just enough of a boozy bite. The drink blended together Mount Gay Eclipse Rum with Malibu and orange/lime/pineapple juices. To get the bright red coloration, grenadine is utilized. For those that decide to begin their night with a stop at Chuy’s bar, the restaurant offers a “Fully-Loaded Nacho Car” which allows one to gussy up their nachos with a number of distinct fixins. The menu at Chuy’s makes it easy for one to come back multiple times and have something wholly different with each visit. I chose the Steak Burrito ($11.69) while the wife chose the Elvis Green Chile Fried Chicken ($10.69). The Steak Burrito made for good eating for two meals, containing a light and fluffy tortilla, succulent steak that fell apart with the lightest prodding, and an amount of cheese that was in perfect portion to the bread and meat elements. 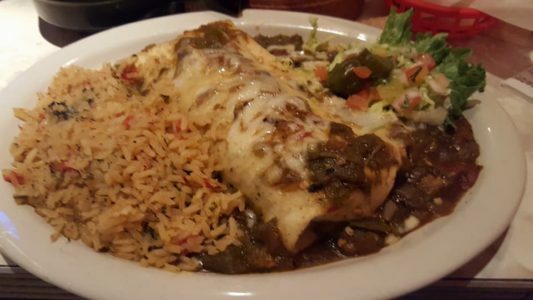 This burrito contained a good drizzle of the aforementioned Hatch green chile sauce; the overall heat level further increased when paired with Chuy’s premium green chile rice. The Elvis Green Chile Fried Chicken uses crushed-up Lay’s chips for the breading of this fried breast. We were astonished at how crispy the crust got while leaving the meat within absolutely juicy and succulent. Where many restaurants skimp on the children’s meal offerings, Chuy’s brought our daughter massive cheese quesadillas ($5.49), kissed with just the right amount of char from the grill. 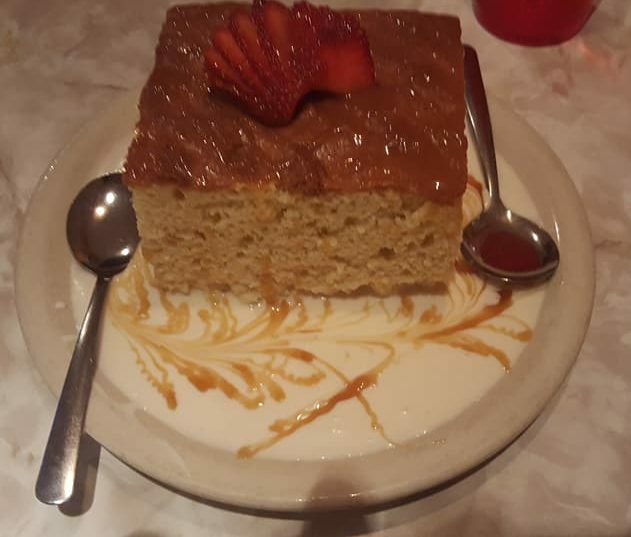 To conclude our meal, we had a huge piece of Chuy’s Tres Leches (three milks) cake brought out to us. Despite being stuffed from the chips, appetizer, and entrees, we were able to dig on in and were able to experience a rich, tender milk flavor alongside a firm, spongy cake. With all three of us getting a good serving, we were quite impressed to see that we had only eaten about half of the cake. If you’re in the North Little Rock area and want to get a bit of authentic Tex-Mex food for a very approachable price, search out Chuy’s. Friendly servers, ample servings, and an unmatched experience await you. The restaurant is open from Sunday to Thursdays 11am to 10pm and on the weekends (Fridays and Saturdays) from 11am to 11pm.